After months of speculation, the Spring Awakening Music Festival official line-up has been released, along with a new location. The Spring Awakening Music Festival celebrates its fifth anniversary this year at Addams/Medill Park with a HUGE lineup. Over the span of 3 days, across 8 stages, more than 100 acts are scheduled to perform – including Kaskade, Steve Aoki, Carnage, Deadmau5, Flying Lotus, The Chainsmokers, Zeds Dead, and more. For the first time in the festival’s history, Layaway plans are available. You can purchase tickets here. 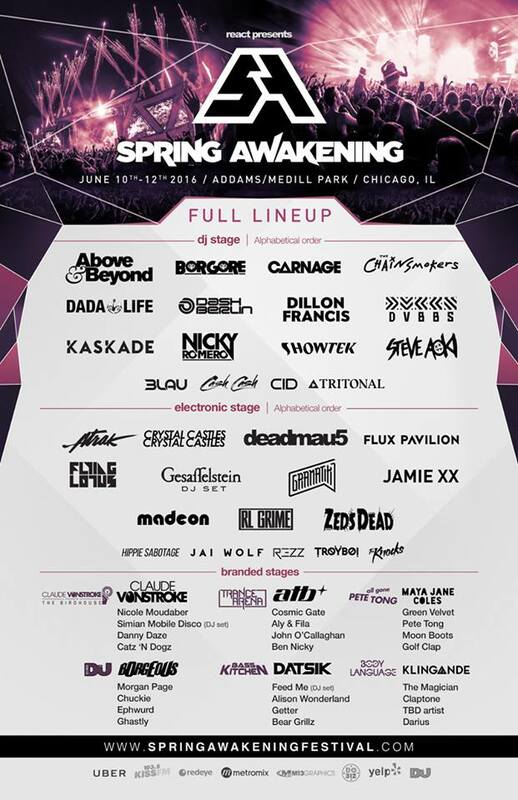 The Spring Awakening Music Festival takes place on June 10-12.